Room Criteria (RC) measures the background noise in buildings over frequencies ranging 16 Hz to 4000 Hz. RC requires a determination of the mid-frequency average level and the perceived balance between high and low frequency sound. 1) Neutral (N). 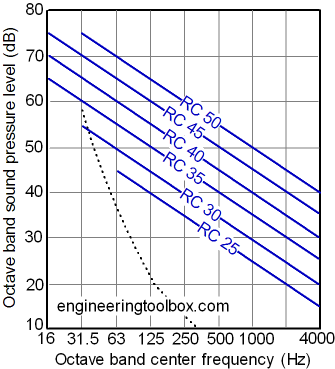 The levels in the octave bands centered at 500 Hz and below must not exceed the octave-band levels of the reference spectrum by more than 5 dB at any point in the range; the levels in the octave bands centered at 1000 Hz and above must not exceed the octave-band level of the reference spectrum by more than 3 dB at any point in the range. Engineering ToolBox, (2004). RC - Room Criteria. [online] Available at: https://www.engineeringtoolbox.com/rc-room-criteria-d_729.html [Accessed Day Mo. Year].